Bread, Bun , Pie and Rusk manufacturing have unique ingredient yeast which is responsible for texture requires either time or conditions ( humid and hot ) to act and release gases which are trapped into dough ( leavening) or fermentation . Various type of provers are available as per plant layout such as Box type , L type or Type , Gas or steam could be used for humidity and heating arrangement .It includes gas burners , steam heaters or steam injection system .Rack type or Traveling tray type provers are available for proving/proofing process.Proofers are thermally insulated enclosures and. vary in size from a small box with shelving to a room. With space for many portable bread racks. Proofer is heated by steam coils or electric heating. Elements located inside the enclosure. Intermediate provers are provided in bread manufacturing process to allow bread to relieve and recuperate from stress- strain to mechanical action on dough by dividers and rounder . It also gives dough to ferment during this time and make dough soften up for Final prover after moulding .Its also called relaxation prover where it travels for few minutes in trays . Dough are converted into elongated cylindrical dough pieces which are twisted and re placed into moulds which are greased with emulsion or oil for depanning . Final prover have arrangement for steam which spread out uniformly in the final prover . Temperatures in Final prover is about 38 deg c - 45 deg c. Humidity level and temperature maintained in such manner that yeast activity is maximum in the final prover . Precautions need to be taken so as to prevent dough to rise above moulds . box or inversely the dough is left without rising . 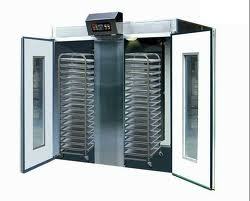 Speed of moulds travel in the prover is either controlled through timers or through manual start and stop . Speed of travel of moulds are to monitored with respect to rate of dough yeast activity . 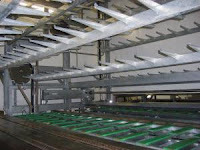 Tray movement could be horizontal ( swing tray ) or vertical ( Contray Oven ) . Approximately time for proving is 60- 75 min as per conditions . Final prover are mostly fabricated at site for large bread manufacturing with drives and sprockets to which racks are attached on which mould s are kept .With completion of cycle in prover the dough which is risen to 3/4 th mould is then transferred to oven for baking . Other popular type of prover are retarder prover . Capacities are matched with that of Oven .